Phoenix was far worse than the things attributed to it. However, times were slightly different then. Intelligence agencies, while powerful, were not as powerful as they are today, in part because of the popular revulsion at their modus operandi. So, one assumes, the Agency really could not prevent the book’s publication. It has been out of print until now. Mark Crispin Miller, professor of media studies and a media critic, is now publishing it as the first of his Forbidden Bookshelf series; an endeavor involving reprinting hard-to-find books addressing the realities of the US social-political infrastructures from a critical (and mostly left) perspective. The Phoenix program was the culmination of a number of counterinsurgency plans undertaken by the Central Intelligence Agency, the military and a few other related agencies. All of these plans, like Phoenix itself, were designed to infiltrate and destroy the infrastructure of the communist-led Vietnamese insurgency—or as it was known by most US residents—the Viet Cong. Valentine describes in specific detail a bureaucratic machinery of torture and deceit: a single-minded operation designed to sow distrust, uncertainty and death. The first several chapters in the book describe and dissect the agencies, programs and individuals involved in the counterintelligence precursors to the Phoenix Program. It is a tale of inter-agency competition and occasional cooperation, clashing egos in Vietnam and DC and differences of opinion between Vietnamese and US police and government agencies. The latter is perhaps best exemplified by the different meanings attributed to the Phoenix bird symbol. The Vietnamese word for Phoenix is Phuong Hoang, yet the graphic used by the Vietnamese represented hope, while the US symbol was a bird of prey holding missiles in its claws. career grounds or because they resented being under CIA command. Valentine ends the body of his text with a look at the US-sponsored warfare and counterinsurgency operations being waged in Central America in the 1980s (when his book was originally published.) If one extrapolates the essence and practices of the Phoenix Program to Washington’s more recent wars—from Afghanistan to Iraq to the so-called Global War on Terror, it becomes clear that Phoenix remains a working template of how the US continues to conduct such operations. 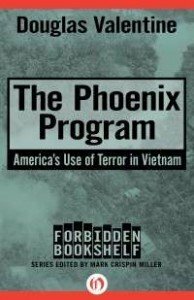 The Phoenix Program is an alternative history of the US war on the Vietnamese. It is closer to the truth than anything published by the military or intelligence establishment and gives lie to the ongoing efforts by various veteran and government historians to turn the US war into a noble effort—something that it never was. There is currently a campaign to commemorate the fiftieth anniversary of the US war in Vietnam. The campaign relies on a revisionist retelling of that adventure and attempts to relieve US forces (military and otherwise) responsibility for the death and destruction they caused. This is one more reason the republication of The Phoenix Program is therefore quite timely. Ron Jacobs is the author of The Way The Wind Blew: A History of the Weather Underground and Tripping Through the American Night, and the novels Short Order Frame Up and The Co-Conspirator's Tale. His third novel All the Sinners, Saints is a companion to the previous two and was published early in 2013. Read other articles by Ron. This article was posted on Friday, July 4th, 2014 at 8:35am and is filed under CIA, Terrorism (state and retail), Viet Nam, War Crimes.